Recently I have been watching television a lot. The main reason being the baby has started taking his tiny steps and I can’t afford to take my eyes off from him. In every couple of minutes either he pulls at something or falls himself on the floor. Yesterday I watched this program(repeat telecast) based on interviews of famous wives like Neeta Ambani, Jaya Bachchan, Gouri Khan, Nirja Birla and others. Apart from peeping in their private world which is hidden from the public eye the thing that attracts me most is the gorgeous set designed by the designer duo and anchor of the show Abu and Sandeep. Though I don’t liked the program much but found a segment very funny where the guests describe their relationship with three words called ‘hooked , booked and cooked’. The way Neeta Lulla rolls her eyes and say ‘I was hooked by Mukesh, I was booked by Mukesh and I was cooked by Mukesh’ or Jaya Bachchan declairs ‘am cooked and that’s all’ say a lot about their personalities. We quite like this segment and now watch this program to check these expressions only, sometimes we also use these words in our conversation. The dish that I want to share today is my all-time favorite. It’s an absolute vegetarian delight, full of nutrients and delicious in taste. Mushrooms if cooked properly can substitute meat and once you taste this curry you will be hooked for life, will book your time whenever you see this in market and will cook and enjoy with your whole family. Jokes apart but this is super tasty. 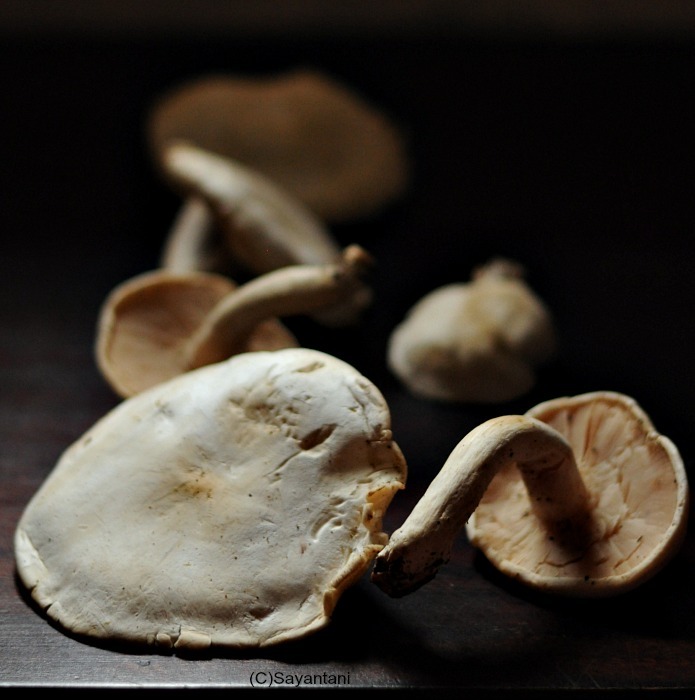 Mushroom has a rich taste, very delicate aroma and soaks up flavours and spices well. Earlier mushrooms were seasonal; we only got to eat these scrumptious dishes only during monsoon. Those days mushroom grew on hay stacks and woods. . Another variety used to grow on sands which are very tiny and thin. 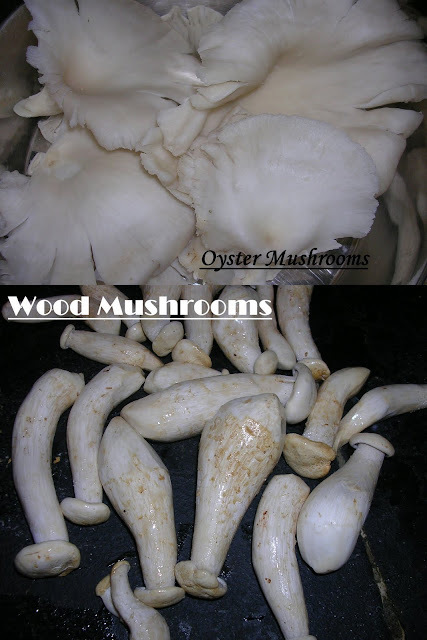 Later seeds of one variety of oyster mushrooms appeared in market and through self help groups now a days they are available everywhere and around the yearIn Bengali mushroom is known as Chatu. I am a self proclaimed mushroom lover. All in my family are aware of my love for mushrooms and wherever I go I get to eat at least one variety of mushroom dishes. I have eaten 5-6 varieties like those oyster, button, wood mushroom, hay stack mushrooms or poal chatu, Sand mushroom (bali’r Chatu) etc. My Maa used to make curries with potatoes but later I came up with different dishes like Mushroom pakora (fritters), mushroom chachari (skilled charred style) mushroom ghugni (with peas)etc but all time favourite is this dish, oyster mushrooms cooked with potatoes and spices.you could also cook this with button mushroom but oyster mushroom tastes better. The dish is best paired with steamed white rice. Peel, wash and cut potatoes in small cubes.Shred the mushrooms, was and drain the water. Keep aside. Heat the oil in a heavy bottomed pan or kadhai and temper with cloves and cinnamon. When it gives off the aroma add in the potatoes, salt and stir well. Cover. Let it cook on low flame till the potatoes are half cooked, about 6-7 minutes. Add the onion paste and stir to coat well. Cook till the raw smell of the onion is gone then add the ginger garlic paste, turmeric and chilli powder. Mix to coat everything well. When oil separates at sides tip in the chopped tomato. Once the tomato reaches a mushy stage add the drained mushrooms. Mix and cover. By this time the potatoes will be soft, if not add 1/3 cup of water and let it cook on medium heat. Once the potatoes are cooked and the juice is dry sprinkle the garam masala powder and serve hot. Check out Ushnishda's mushroom Chachadi here. Such a delectable mushroom curry, makes me hungry..
Nice click and mushroom curry looks so delicious..
i am a mushroom lover too like you! This looks fantastic, love the second photo with rice in the background. bookmarked! I love mushroom curries, and this looks a.m.a.z.i.n.g bookmarked for the coming week! Thanks all for liking this recipe. I love mushrooms!! The only time I ate these long mushrooms was years back when we went to Jhargram and ma had cooked this!! Some beautiful memories.. I was I think 5 & I still remember. Lovely recipe. Sayantani, What a mouth watering and inviting Click. I love mushrooms and always look for new recipes. Ur Mushroom Curry looks delicious. wow..it looks so delicious..makes me very hungry just looking at it..
Eita kon program, kon channel ? @Ushnishda, Thanks mushroom amar most favourite je kono din je kono bhabe khete aar pete raji. @Sandeepa, program tar naam First Ladies, NDTV good times e hay.last year er ota akhon repeat telecast hoche. Dear Sayantani, Please collect the Beautiful Blogger Award from my blog.You deserve it.You are a great blogpal. I have an award for u...pls visit my space to collect it.. Thanks Dolly and S for these lovely awards. for quite some time i was eyeing those lovely awards showered on others and finally they are mine. am so happy. 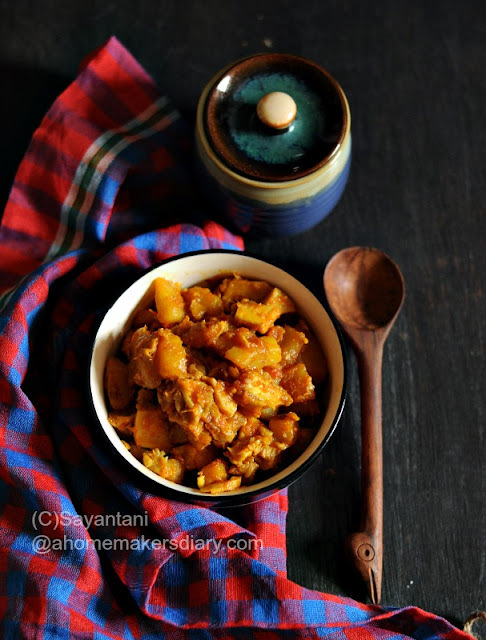 Just discovered your blog, found it to be so informative and great recipes too, will come back to explore more. Use organic ingredients in baby food recipes, to be sure that you are avoiding pesticides. The health benefits of mushroom include relief from high cholesterol levels, breast cancer, prostrate cancer, and diabetes. It also helps in weight loss, increasing immunity. Thanks for sharing this healthy recipe.